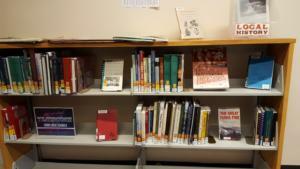 Lacey’s new Local History collection is beside the Adult Information desk. Attention local history buffs! If you have an old high school yearbook from Thurston County or any books with specific information about our area, the Lacey Timberland Library would love to accept your donation! Our staff has started a special local history section with items of interest of Western Washington, Thurston County and Lacey. We are working on acquiring current high school yearbooks from North Thurston Public Schools but would also appreciate donations of any previous yearbooks – writing and dedications included! 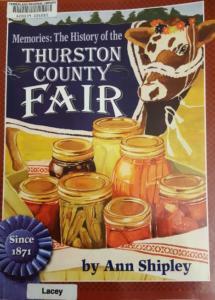 Did you know the Thurston County Fair has been around since 1871? Memories: The History of the Thurston County Fair by Ann Shipley provides not just a description of the fair but offers a fascinating peek into the culture, lifestyles and current events of Olympia from the fair’s first years in the 1870s through 2005 when the book was published. 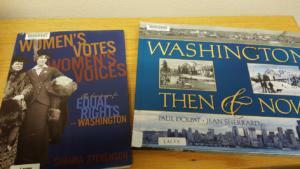 Do you know the full story of how Washington women got the right to vote? Women’s Votes Women’s Voices: The Campaign for Equal Rights in Washington by Shanna Stevenson covers the early suffrage efforts in Washington Territory through the decisive victory in 1910, which reinvigorated the national movement leading to the passage of the 19th Amendment to the U.S. Constitution. The book also reviews related legislation in the modern era, such as the Equal Rights Act, Title IX and Roe vs. Wade, and the legislative efforts of women in Washington State. In Washington Then & Now by Paul Dorpat & Jean Sherrard, a picture says a thousand words…in this case, comparative pictures of historical and present-day Washington says plenty! Side by side photographs of notable landmarks, businesses, cities and landscapes give the reader a visual history of our state, accompanied by vivid descriptive captions that speak to the changes time has wrought. So, if you’re intrigued and want to know more or would like to donate your old yearbook or local history book to the collection, stop by the Lacey Timberland Library, 500 College Street SE, and check us out!